Yes, you heard that right! We've added another physical location to our brick and mortar store, Nest Interiors. I've largely been absent because this has been all consuming, plus running our main shop, and throw in twins...and you know the rest of the story! 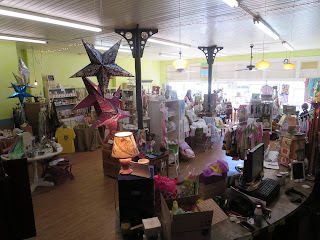 Our newest location is inside Rustic Treasures in neighboring Hammond, LA. It's a wonderful vendor mall...just the thing I was looking for to expand our brand. 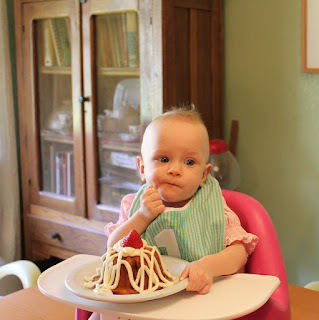 And though she may be small...she is mighty! We've packed our booth with shop winners from our exclusive silk-screened towels, candles, to decorative papers. We're still kicking around names...Nest Too, Baby Nest, Nest Deux. Either way, we are smitten with the new space...all I could do yesterday as we put the finishing touches together was stand and smile. 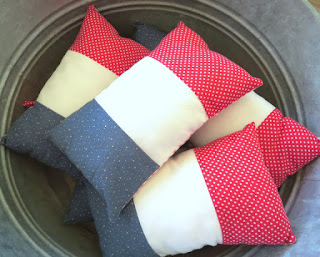 Also, coinciding with the opening of the new space is the launch of my Petite Pillow. 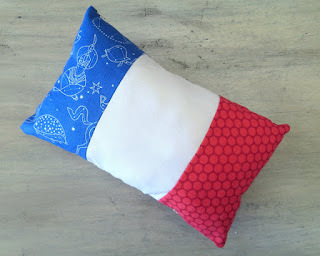 It's a tiny pillow (the French Flag is my opening design) and each is filled with a combination of polyfil and dried lavender and a spritz of high quality essential oil. 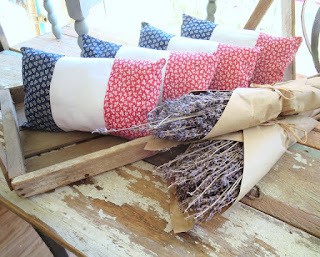 They make wonderful large sachets, a tuck in to freshen a guest bedroom linens, or placed near a favorite seat to enjoy the fresh lavender scent. Both the new space and this new product introduction were conceived (or perhaps realized) during the Virtual Retreat I took with Kimberly Wilson this month. I was surprised, not only to realize these dreams but to pursue and fufill them so quickly! There are three styles currently to choose from in the Petite Pillow, and all are available at our three locations...Nest, Rustic Treasures, and Online. Choose from French Country, French Rustic or French Moderne...all are packaged to be given as a gift but you may want it for yourself! 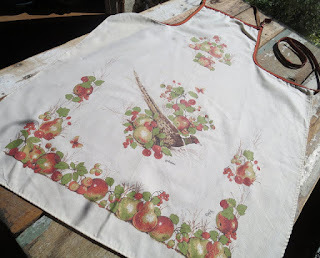 With the arrival of Spring, I usually take this time to take stock of bird-centric items for the shop and at home. Making extra sure there are places to nest, eat and drink to raise a new flock of feathered friends. 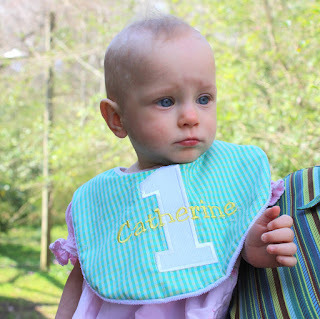 The above feeder is my favorite that we sell, and I've restocked for spring. 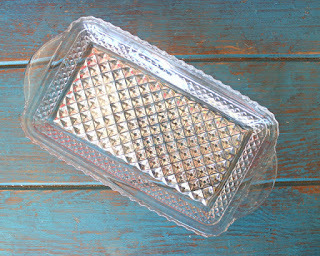 It has a great vintage look and very easy to unscrew and clean. The tray should not hold water as it has tiny holes for a spring rain to pass through. 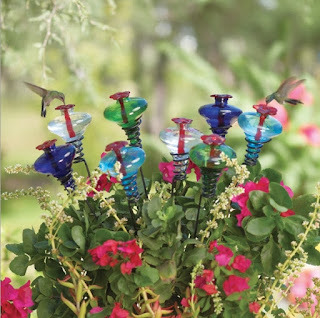 I like these mini blossoms for our hummingbirds; they're great to add in a plant of salvia, lantana, or other hummingbird attractant...call it a bird buffet. 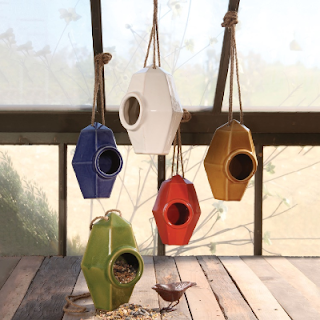 And why not let your birds live in style, simple and easy to clean ceramic would make a nice home for chickadees, wrens, and sparrows. Green and amber are available online at our website. Food for thought...don't forget to plan for some natural sources of food in your yard. 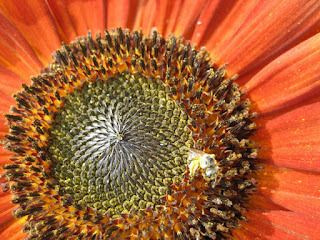 We carry and plant in our own yard a couple of the sunflower varieties from Hudson Valley Seed Library. Here is velvet queen...you'll enjoy the rich blooms and birds will enjoy the seeds that follow. 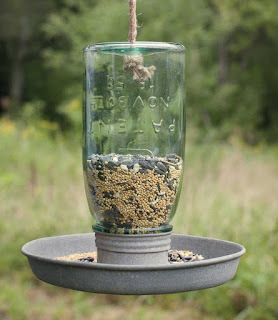 Here's an idea we're loving for nesting birds (and putting to use at home too). Take a suet cage and fill with natural materials for birds to pad a nest. This picture shows yarn fibers and as pretty as it looks, its actually not recommended for our delicate avian friends. 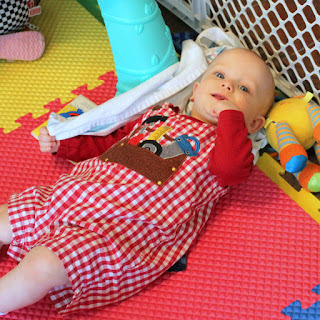 Preferred choices are natural cloth strips, wool, jute, burlap, pine or wheat (tiny twigs work), grass clipping, and what did we use...dog fur! We often watch birds dip down in the yard to steal bits of our husky's fur. 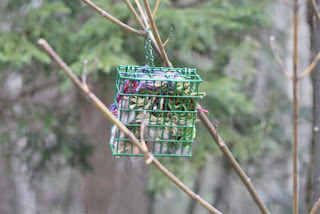 This season I've been putting the remnants of each grooming session in the suet cage and hanging along our fence line. I even saw our 1st pair of chickadees grabbing a mouth full and stuffing it in their newly claimed house! Keep in mind, don't try this if your dog gets flea dipped. Just remember to offer items that are chemically free and that are not too fine to wrap around a nestlings leg. 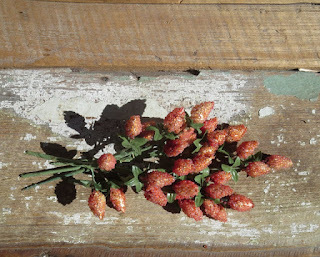 Sometimes I forget to share how many lovely vintage and antique items we offer in the shop. 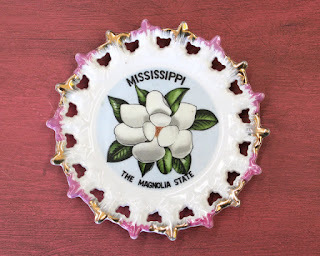 We take trips several times a year out of state in search of unique vintage decor and fabric; and if I had to pick a favorite, I love our trips to source items -- the thrill of the hunt! All are available in our Etsy shop (including my handmade goods and craft supplies). And expect more arrivals this month! 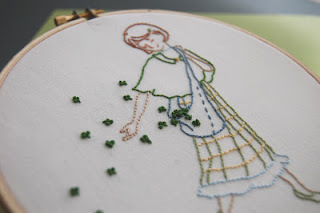 another freebie to get your March going, released in 2010, this sweet St. Patrick's Day embroidery pattern has been on my to-do list (maybe this year?!) I keep going back to it...see how sweet? It was a huge weekend for us! Thank you to all who came to our 8th anniversary sale on Saturday. This day and age it is super rare to say you are a gift shop that's been in business this long. 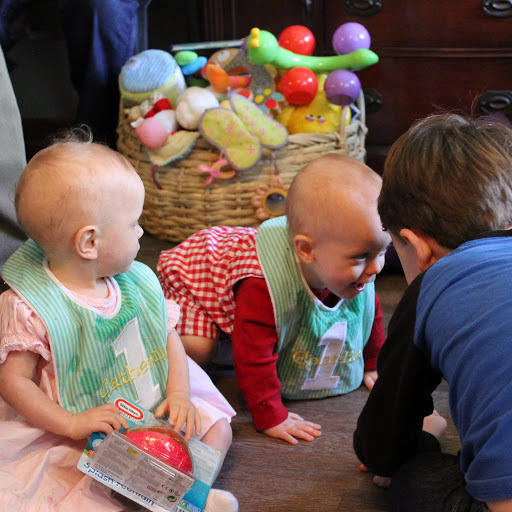 The very next day was also cause for celebration as we invited a small circle of family for our twins 1st birthday. Ok, we're a little late celebrating (by a month) but we could not of asked for a prettier Spring-like day! 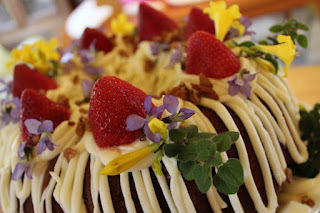 It's wonderful and the perfect breakfast-y kind of cake with banana, pineapple and pecans. 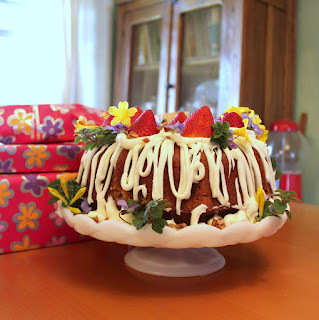 I can bake a cake but decorating...not so much; I went foraging and luckily found wild violets, jasmine, and fresh oregano all available in the yard and woods. This recipe calls for nuts - so we made two mini cakes sans nuts and sans alcohol in the frosting. They weren't too sure about it, especially with a crowd egging them on to eat. 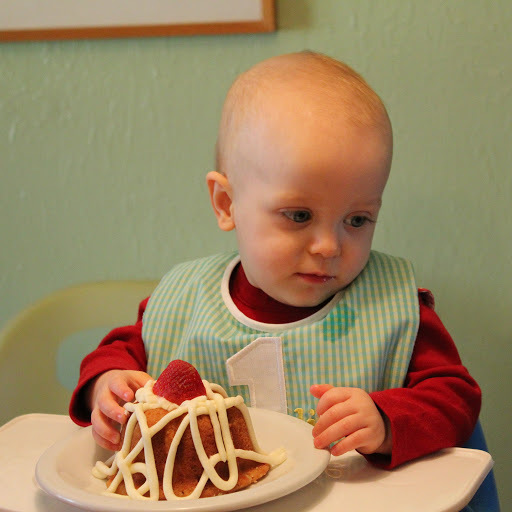 Eventually, they got into it and particularly loved the strawberry and icing. Definitely, try the cake out if you are looking for a unique sweet for a special occasion. Also, a special thanks to our vendor, Lisa Elstrott and owner of the now closed but once popular Lisa's Children Boutique in Ponchatoula, LA - she made the adorable bibs pictured for the twins to celebrate their first birthday! Her handmade items are so well done and I'm pleased to have her exclusively at our shop.